I have my own business of over 15 years, called “Farm House Graphic.” About a year ago, I started painting again after over 30 years. I worked and lived in NYC back in the 60s and 70s. I worked the last seven years in NYC for Photo-Lettering, Inc. and then moved to Atlanta, Georgia in 1972. In Atlanta I worked as a free-lance graphic artist until 1976 then worked full-time for Communications Services in Atlanta for ten years. Afterwards I started my own business in Flowery Branch, GA and later moved to Dahlonega, where I still have my business out of my home. 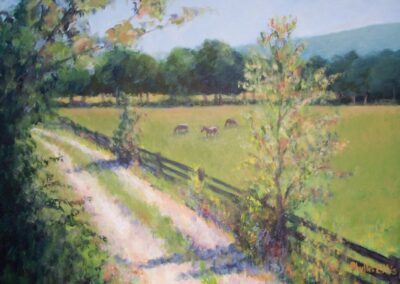 My paintings have been shown and still are in some galleries at: Quinlan Arts, Sawnee Arts Association, and Dahlonega Arts Council where many of my paintings sold there and out of my studio in Dahlonega and also at Dahlonega Arts Council. I wrote and illustrated the book “Big Boy” and had it published by AuthorHouse. The book can be bought online through AuthorHouse.com or Amazon.com or Barnes & Noble.com.